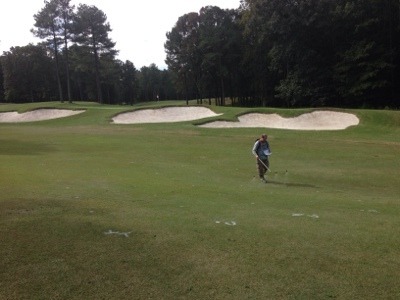 You may notice several paint dots at the end of the fairway on hole number 5. These paint dots are test plots that have been sprayed and will be monitored throughout the fall and spring to see how the Bermuda grass reacts to the treated verses untreated areas. The disease that is being tested for is "spring dead spot". David Mc call, who is a pathologist with VT is conducting the test study. I will update you in the late spring as the bermudagrass starts to green up.